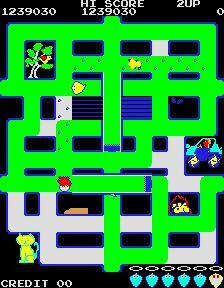 Make Trax is a pacman style maze game. You control a paintbrush, where the objective is to complete each level by painting all the white areas to the required colour (green, purple or orange/red). You must avoid the 2 fish, which pursue you relentlessly. You do fortunately have one defense against the fish: you can kill them by running over them with either of the two paint rollers, located centrally in either a horizontal or vertical direction. This will provide a temporary respite from the fray for a few seconds, while the fish return to their home under the vertical roller to regenerate, but they're soon out and after you again! Screen One : A cat which leaves footprints behind. Screen Two : A mouse which leaves footprints behind. Screen Three : A bird which leaves droppings behind. Screen Four : A car wheel which leaves tyre tracks behind. Screen Five : A faster cat which leaves footprints behind. Screen Six : An invisible man who leaves footprints behind. Any areas they move over have to be repainted, but you score 10 points per segment repainted. If you can capture any of them you score a 1,000 point bonus. 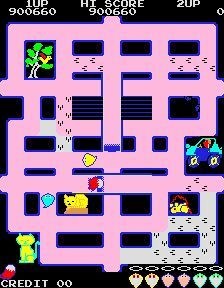 After each sixth screen they repeat, but each subsequent screen gets faster and the pursuing fish get more intelligent and will try to trap you from either end of a roller. Scoring: Painting floor: 10 points per segment or footprint/tyretrack/dropping. Killing Fish: Points increase the more fish you kill on each level. Points scored: 50, 100, 200, 400, 800, 1600, 3200, 6400 and the maximum 9,000. 1,000 Bonus : For capturing any of the creatures/objects which mess up your paintwork. One extra life is awarded at 10,000 points. Various bootlegs of Crush Roller, including the obligitory "modified to run on a Pac Man board" version. There are 6 versions in all - including Paint Roller and Magic Brush. 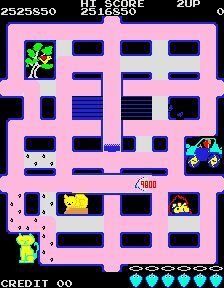 Some differences in versions are that the intro music is longer, no end of screen bonus is awarded, and there is no highscore table. Starting lives can be set to 3, 4, 5 or 6 (default is 3). 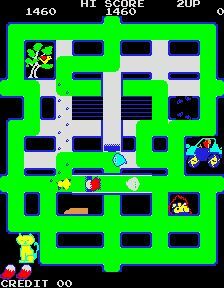 The first level can be set to easy or hard (default is easy). Teleport holes can be activated which appear randomly on the screen. Entering a teleport hole returns you to the level start position (default is off). Make use of the fact that the fish always chase you by luring them to the rollers. You should use the bottom (horizontal) roller for the majority of your kills. The 50, 100, 200, 400 and 800 point fish on the first screen only make no attempt to run away from a roller, making them easy to kill. The 1,600 and 3,200 point fish on level one and all first fish on each subsequent level will not run away if you sit directly at the end of the bottom roller and wait for them. They will sometimes do a quick reverse as you reach the end of the roller if they are following you, but will then turn to pursue you once more. You can then roll over them as they run towards you. They will try to run but usually(!) won't escape. At the point where the fish do not run towards you when you are waiting directly at the end of the bottom roller, you will need to move one segment to the right and wait there (above the mousehole). It's then a matter of critical timing, as you can then use the roller to kill the fish by hitting it at the right time. They will sometimes try to run, but on the earlier levels you will successfully squash them. Use the left/right and top/bottom tunnels as a shortcut from one end of the maze to the other. Note that the white areas at the tunnel entrances MUST be painted. There is a maximum number of 9,000 point fish you can kill on every level. On level one this is 1x9,000, on level 2 it is 2x9,000 and so on. This can be increased by 1 if you kill the last available 9,000 point fish at the same time as another, giving you an 18,000 point kill. After this point the fish will not follow you on the roller at all, and there is no option other than to complete the level. Try to kill the fish in pairs where possible, giving you more free time to paint the maze. Use the top roller to group the two fish together. Get them to follow you and repeatedly go back and forth on the vertical roller, until both fish are closely grouped at the top of the screen. Then make your way to the bottom roller and if you are lucky they will both follow you down and you have more chance of killing them both together, maximising your points. If only one follows and the other exits through the top tunnel it will be much more difficult to kill the one fish as the other will reach the right hand side of the bottom roller while you are trying to use it, greatly increasing your chance of death. An alternative method to kill the maximum number of fish on a level is to repeatedly move back and forth on the bottom roller with the fish on the same horizontal level. After a few moves back and forth (around 12 or more) the fish will both be grouped right at the end of the roller. Lure them towards you by moving towards them from the far end of the roller, double back and when you try to kill them they will both double back into the roller. This way you can always ensure killing the maximum number of 9,000 point fish on any screen. Once they no longer want to follow you on the roller, clear the level. 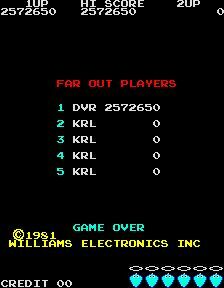 Many, many thanks to J Salvador Tenorio for this tip, which I now use religiously and have improved my personal best MAME score by over 800,000 points! 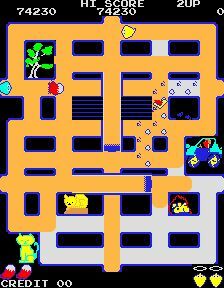 Download my MAME 0.37b10 recorded input file (92k) from MARP for Make Trax . My best game scores 2,572,650 points.